Another Beautiful Day in Paradise. We had beautiful clear blue skies, a little breeze and temperatures in the upper 80s. 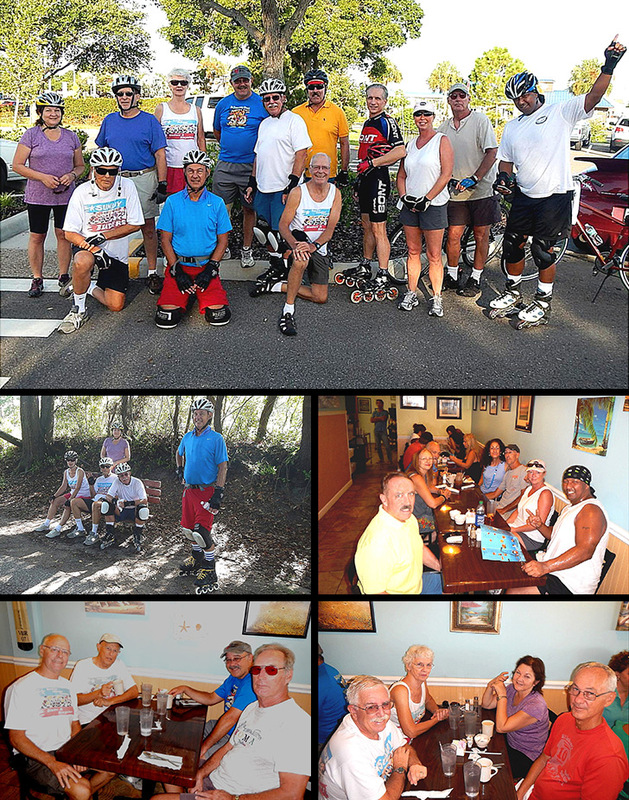 Bladers/Bicyclers Sara D, Dave A, Carol J, Rob Hauser, Dee T, Rob H, Charles C, Laura P, Roy H, Breeze, Steve G, Jeff B and Bruce M. Welcome all. We decided to head North as the Trail is nicest going North. We couldn't really tell which way the wind was blowing so it didn't matter. Going North was good. The Trail was smooth and we had 1/4th to 1/2 shade on the Trail. We ended up in 3 groups. One group did 12 miles to Klosterman Rd and back. One group did 15 miles to the Old Train Station and back. One group did 19 miles to the Sponge Docks and back. We had 4 bladers and 9 bicyclers. We Brunched at Benedicts as planned. We got right in and seated at three tables. However as the groups did different distances we came into Benedicts in 3 shifts. We had a pleasant surprise as Chris & Theresa came in and joined us. The service was pretty good and the coffee flowed freely. Unfortunately as the first shift was leaving the third shift hadn't been served yet. The two shifts agreed on a 9.5 for Benedicts.